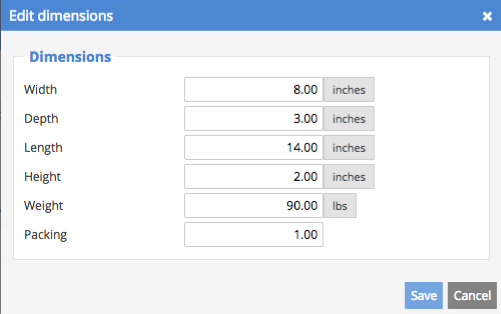 Sellsy allows you to manage the weight and the dimensions of your products. These data can be used to calculate the deliveries prices, they can be standardized from your Sellsy account. By default, units have been chosen based on your region, but you can edit them in Settings, then Lists (units, taxes...). Note: if the used unit is always the gram, you can of course display other units, such as kilos, on your documents. To manage a product's dimensions, go to the product record, then click on Manage the dimensions. How do I add a product to my items list? How do I add pictures to my products? How do I import my products list? How to delete products/services in bulk? How to use price categories? Ho to use pricing exceptions? How do I add a barcode to a product?